Street photography has played a huge part of my life ever since I got serious doing it. In fact, before I bought my first camera back in 2014, I was already researching about street photography and the most influential artists who revolutionized it. Without further ado, I present to you my 5 Street photographers who had influenced me and has inspired me to keep on improving my craft. Though he had shot black and white before and even made books with in that medium, for me his talent really shines through his color work. One of the colorful photographs he has made is published in his book “The Last Resort”. I have yet to get a copy as of writing but I’ve seen some of the photographs in the book and I can already tell that it’s crazy good, its super colorful, and for sure if eyegasm is a word, that will be the best way to describe it. I would recommend you guys check his books. Well, I have a love hate relationship with shooting in color, but lately, I’m forcing myself to dig into it and look for color, look for interesting situations and frame them all in one shot. It’s still something I’m struggling to be honest but I’ve made some success and that makes me optimistic. 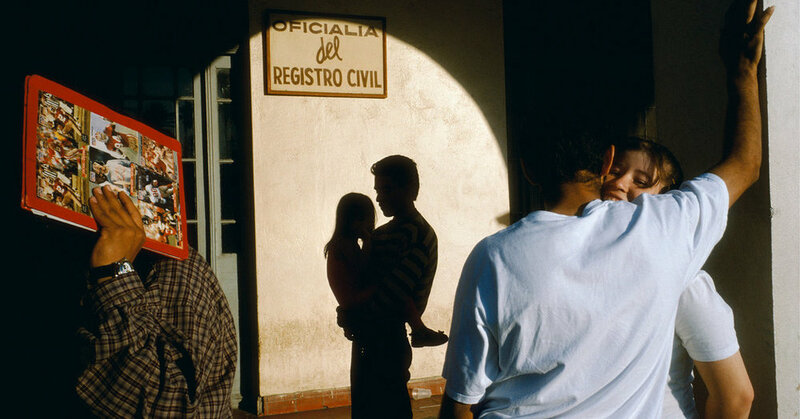 When it comes to referencing the best street photographs to my friends, I’m always quick to pull out an Alex Webb photograph. As if I am a salesman trying to sell some products to a potential client. He’s that good, and by I can honestly say that he is my favorite street photographer shooting in color. And the color is not even the strongest character of Alex’s photos in my opinion. It’s his ability to compose photographs in layers, use of shadows, and filling the frame. He is able to create photographs with all these present in one photo and it blows my mind. Take this photo below for example. Layers: check, Colors: check, Shadows: check, Filling the frame: check. His style, the way I see it, is a complex mixture of different elements where he has to be there at the right time with and somewhat a photo already pictured in his head. He just has to wait there till everything falls to the right place as if they are on a stage following blockings and the light man ready to shine the spotlight on the star. It sounds entertaining but boy, I can already tell just by imagining that it's one tough photo to nail. I once chanced upon a street photographer in Singapore, his name is Aik Beng Chia (through Instagram’s live video. ha! Bet you thought in person but yeah, no.) who is quite known for what he does, and I asked him what are his tips with regards to layering in photographs and he told me, and his audience, that it’s one of or if not the most difficult technique or style to do. Because you have to be analyzing a scene, looking for the right angle and having the right elements in place before you can take the photo. Honestly, I am always trying to add layers and filling up the entire space and indeed it’s very hard to make the right shot. Although every time I attempt to do it, I improve my waiting game, I become more patient, my eye starts to see patterns and colors, I start to understand how I can use shadows and harsh light to my advantage and generally pushing myself to work the scene and capture the right photo. Every time I go out there, I exhaust the scene make validates the fact that I’m learning and improving. Alex for sure had influenced me to push myself and find ways to improve as a street photographer. I love Winogrand for these 2 reasons. First is the sheer volume of the photographs he took making him arguably the most prolific street photographer (Although he never liked the term) of his time and I’m guessing he can even compete against the digital age at this present time. Second are his photographs and how he describes his concept of taking photographs. 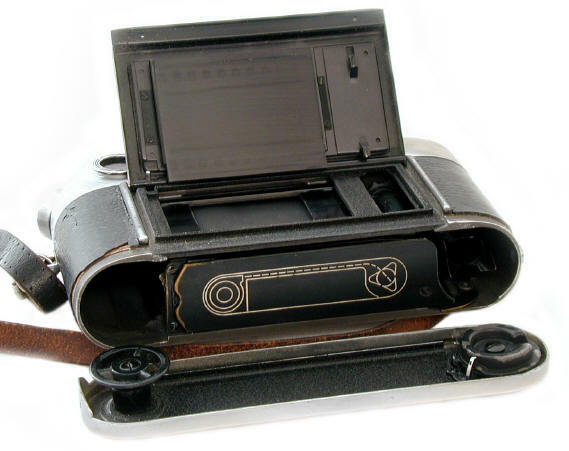 Take a look at this video and wait for the scene where he keeps his rolls of film in his drawer. Now Take a look at his camera he was using and notice the film already marked on the pressure plate. Winogrand has an odd approach to photography. In one video I’ve watched he said there that he doesn't think about pictures but rather he photographs life. And in fact, this is really what you will see in his photographs. Everyday life, the odd things, the candid moments where people are swallowed in their own space, emotions, and celebrations. Gary shoots like he’s holding a semi –automatic rifle. That is probably why he was able to capture life in such magnitude. He was always present and alert. He’s photographed so much that when he passed at the age of 56, there were still thousands of undeveloped rolls left behind. He didn’t even get to see tons of his developed photographs. When Winogrand stands in a middle of the street, he just goes on and on snapping pictures after another. I can’t even finish a roll in an average day. I don’t try to shoot as much as Winogrand, but I always make sure that I keep myself motivated to shoot. One photo a day is better than nothing at all. Recently, I have been gravitating towards a lot of works by Fred Herzog. A colorist with photographs that are so nostalgic. You can really feel the retro-ness of his photographs. In a time where black and white images dominate the scene while a colored film is used less being a pretty new medium, Fred had managed to create such a distinct and refined style. 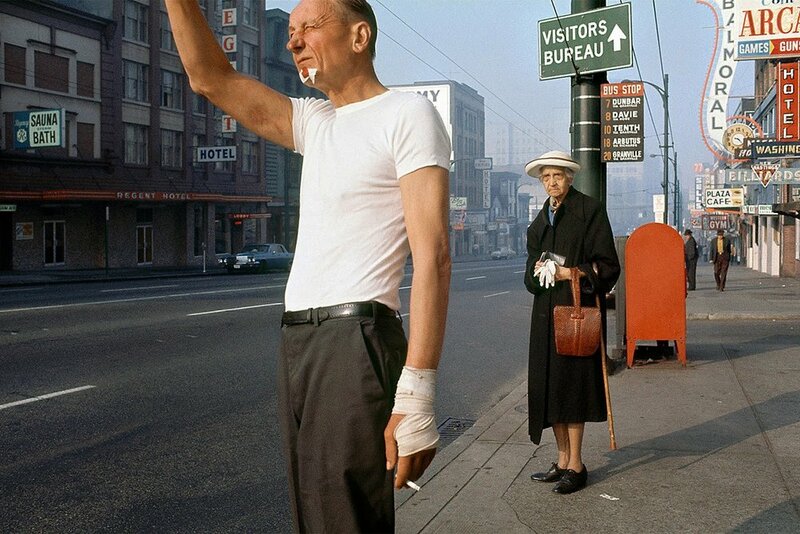 If I could describe Fred Herzog’s photographs, it’s like seeing vintage posters from the 50’s- 60’s. It looks like it was painted rather than photographed. Though he shot everything in color, red seems to dominate a lot of his photographs and while the red seems oversaturated, the rest of the colors are muted. It’s that signature of him that has got me intrigued of his work. I have yet to really bring my style into maturity. I think it’s going to take a while as up until now I’m still learning and growing. But recently, as I look more into Fred’s color work, I tend to push myself to look for dominant colors and include that in my overall composition. It’s a fun challenge, you should do that too! Now for the last photographer on my list and my all-time favorite, no other than Magnum photographer, Josef Koudelka. A Czech photographer that has captured one of the most historic events of the late 60’s. He lived as if he had no permanent home, traveling from one country to another within a short period of time mostly sleeping outside rather seeking for a shelter. Koudelka’s images are compelling and intriguing. Some have a taste of suspense and darkness. It’s his style that made me fall in love with it and continue to look back on his photos. I’ve read somewhere that Koudelka’s images have the “snapshot” feel to it and I used to totally agree to that but the more I see more of his works the more that I disagree. He’s got a lot of images that he’s put a lot of thought to it. The composition is on point and he makes good use of techniques such as leading lines or triangles to draw your attention. Take a look at one of my favorite photographs of him posted below. You can see that your eyes are basically drawn from the edge of the frame where the three gentlemen are to the man in the middle of the scene. All three men’s head is also turned toward the person in the middle. You will also notice the leading lines in this picture. And those are the walls and the shadows going towards its vanishing point eventually leading to the man at the middle. This photograph is nothing but superb. I think, looking at Koudelka’s photographs, the audience will experience the urge of asking why. His photos give more questions than answers, and that makes his photographs so strong. It’s its ability to get your attention and challenge you to question it. It gives little clue enough for you to wonder and linger a little further. Staring at the photo trying to look for more clues. It’s a remarkable talent for sure. It calls your attention to look, then you will realize that you’ve already spent a couple of minutes because the photo made you think. It’s that style that separates his photographs from the rest. Most of my photographs before are shot in black and white, that way I became more focused in my composition. I try to look for elements to draw attention. As I venture out shooting more color photos, I still look for this things. As much as possible I initially try to find ways to draw the viewers’ attention, simultaneously adding more elements to enhance my photos. But sometimes, one interesting thing is already enough for you to snap a photo of it, so just press that shutter. There you have it, my 5 most influential street photographers that had inspired me to be a better photographer myself. I've got a long way to go but I'm sure am grateful having known these greats and being a great foundation for my own photography journey. I hope this inspired you as well. Share it if you liked it, comment your thoughts and be make sure you go out and shoot!